A list of hair and body butters and their benefits. 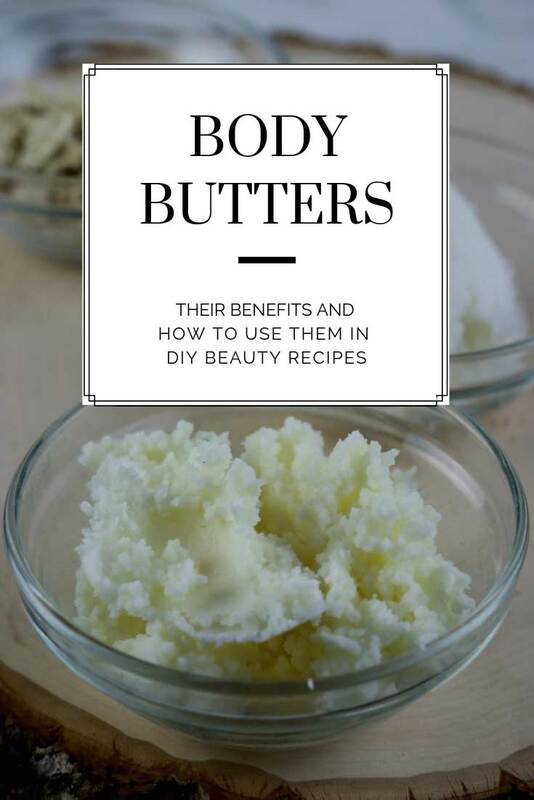 Learn how to use shea butter, cocoa butter, mango butter, and other butters in DIY beauty recipes for the hair or skin. When you're making DIY bath and body, DIY hair care, or DIY beauty recipes, you'll need carrier oils, hair and skin butters, and essential oils. I already have a post dedicated to different carrier oils and the benefits and several posts talking about essential oils, but I didn't have anything devoted to the different body butters and their benefits. Hair and skin butters are plant based ingredients that are thicker than carrier oils. They are usually derived from a plant seed, bean, kernel, or nut. When added to a DIY bath and body recipe or DIY beauty recipe, they each have unique properties that promote skin or hair health. Body butters are high in proteins, vitamins, and fats that help nourish and moisturize your skin and hair. Their fatty acids make them a solid at room temperature, so they are thicker than carrier oils. The most common skin and hair butters are shea butter, cocoa butter, and mango butter, but there are several more butters that have amazing benefits for natural beauty. Each butter has its own unique properties, so you can choose the one that's best for your DIY recipe. Generally, you can swap butters in most DIY beauty recipes like lotions, body butter recipes, or sugar scrubs. This isn't a complete list of hair and skin butters and their benefits, but these are the more common butters. Some website have other butters for sale that are actually a carrier oil and a solid vegetable oil. I did not list those because I would use the carrier oil and one of these butters in its place. Hair and skin body butters come from the seeds, kernels, nuts, or beans of plants. They are comprised of fatty acids and minerals and don't contain water. This gives them a longer shelf life without needing a preservative. Since they are thick and solid at room temperature, it helps create a barrier on top of the skin that can hold other ingredients against the skin longer for longer effects. Some natural butters do have an odor. Cocoa butter smells like chocolate, and bacuri and ucuuba butters have an earthy smell. Shea butter can also have a light aroma. When choosing butters for your DIY beauty recipes, look for unrefined butters. Also look for cold pressed butters, which means that heat and solvents weren't used in extraction. These butters are usually more expensive than heat extracted butters, but it's well worth your investment to get higher quality ingredients. When choosing the right body or hair butter, take into consideration the consistency of the butter. 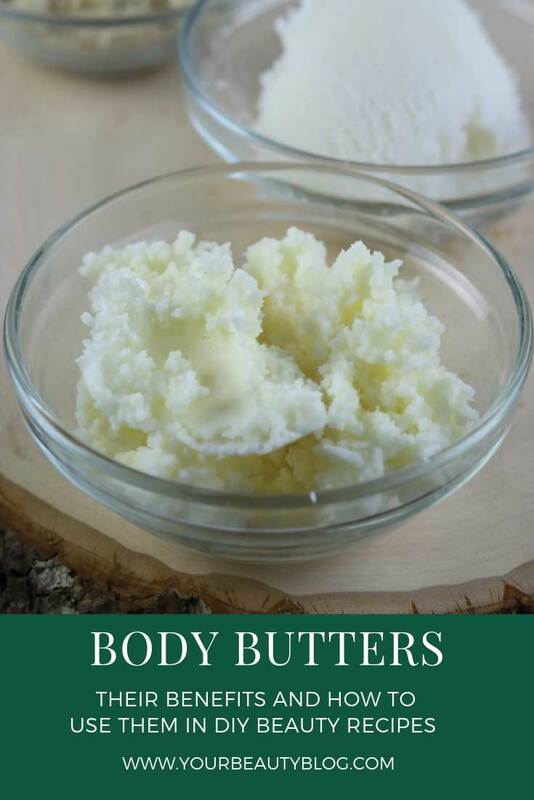 Generally, lighter butters will absorb quickly without leaving an oily residue. This is important for oily skin or for your hair. On the other hand, heavier, thicker butters tend to be more moisturizing, which is great for dry or damaged hair or dry skin or eczema. Don't be afraid to combine butters. This gives you the benefits of both butters. For example, I often combine cocoa butter and shea butter or mango butter. This gives me the benefits of the cocoa butter and the hardness that I need for a recipe, but it also tames the cocoa scent and also gives me the benefits of the other butters. Natural skin and hair butters do have a shelf life. If it smells off or rancid, discard it and don't use it. Store your butters in a dark place so the light doesn't shorten the shelf life. Along with the hardness of the butter, you also want to take into consideration the rate at which is absorbs into your skin. This is probably the most important factor to me when choosing a hair and skin butter for my DIY recipes. Fast absorbing butters soak into the skin quickly, so they won't leave your skin or hair oily. They moisturize without leaving behind a greasy film on the skin. These butters are thicker and more oily. They tend to be heavier and leave the skin feeling somewhat oily, but they are excellent for dry skin or hair. These butters are in the middle. They are great all purpose butters that can be used for most applications. I buy my shea butter, cocoa butter, and mango butter from Crafty Bubbles. I've used other brands, but theirs are higher quality at a great price. When I compare their butters to other brands, Crafty Bubbles feels, looks, and smells better. They are also available on Amazon, which is where I will link to. For more exotic butters, I recommend Paris Fragrances. They are also available on Amazon, which is where I will link to in this post. Bacuri butter is a dark natural butter that has an earthy smell. Because of its dark color, it can stain clothing, so be careful using it in DIY recipes. Bacuri butter is said to help promote collagen and elastin production. It's very moisturizing and a natural emollient. It's also anti-fungal and anti-bacterial. It's said to help promote hair and nail growth and promote healthier skin. It leaves a greasy thin layer on the skin that then absorbs, making it a great butter for dry skin or eczema, but not such a great butter for a non-greasy body butter or emulsified sugar scrub. Caucacu butter is an excellent skin and hair butter for moisturizing. It helps the skin retain moisture and boosts elasticity. It also helps provide hydration for both hair and skin for hours after you use it. Its high phytosterol levels help it absorb extra water, which helps it hold moisture next to the skin and hair. Because of this, some people use it as a pant-based substitute for lanolin in skin care recipes. Cocoa butter is a fairly common skin and hair butter. It has stable fats and antioxidants, so it has a long shelf life of two to five years. Cocoa butter is hard at room temperature, but it melts quickly when it touches the skin. It's absorbed quickly into the skin, and it absorbs deep into the skin for more healing. It's a natural emollient and moisturizer thanks to the omega- and omega-9 fatty acids. It also has polyphenols, which are said to reduce the visible signs of aging and soothe irritated skin. Cocoa butter can help promote skin elasticity and improve skin tone. It helps boost collagen production and hydrate the skin. Illipe butter is a little known butter, but it's a wonderful addition to your stash of ingredients. It's hard at room temperature, so it's sometimes used as a substitute for cocoa butter. It's a natural emollient and moisturizes the skin, so it's a great natural moisturizer to add to DIY recipes. It can also help improve hair health and add moisture to dry hair. Kokum butter is one of the hardest and most stable hair and skin butters available. It's a natural healer, and it promote skin regeneration. Kokum butter is an excellent natural emollient, so it's good to use on dry skin or hair. Although kokum butter can be applied alone, it's often used with other butters and carrier oils because it is so hard. Mango butter is another popular butter and one that I use often. It's not greasy, and it's absorbed into the skin quickly. It softens and soothes skin while it moisturizes. It's said to restore skin flexibility and reduce the rate at which skin cells degenerate. While other butters can have a strong aroma, mango butter has a faint aroma, so it's great for recipes where you don't want the scent to be strong. Rich in vitamins A and E, mango butter is a good ingredient for reducing the appearance of fine lines and adding hydration and moisture to the skin. Murumuru butter is an excellent emollient, so it's often used in hair care, soap, and lip balms. It's high in vitamins A and C and omega-3 and omega-6 fatty acids for hair and skin health. Murumuru butter has a higher melting point than does mango butter or shea butter, so it's a good butter to combine with them for a melting point that's somewhere in between the two. Or you can use it alone in products where you want a higher melting point. Sal butter isn't a common hair and skin body butter, but it has many benefits. It's similar to cocoa butter and can be used in much of the same applications. It's high in antioxidants and is an excellent emollient for the skin and hair. It spread easily on the skin, making it perfect for lotions and body butters. 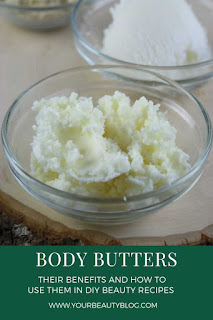 Shea butter is a popular body butter, and it's one that I use often. It's high in vitamins A, E, and F and essential fatty acids. Shea butter is said to help promote collagen production to prevent the signs of aging. It's very moisturizing for the skin, and it's non-greasy. It helps form a barrier on your skin to lock in moisture, so it's a great skin butter for dry skin. When you use it on your hair, it moisturizes without making hair too oily. Tucuma butter is high in antioxidants to battle free radicals in the body. It's fatty acids protect the skin while it moisturizes and boosts hydration. Tucuma butter is almost like a natural silicone product. It has the benefits of silicone without the harmful side effects. When applied to the hair, it coats the strand without weighing down hair or drying it out like silicone can do. Ucuuba butter is a yellow to brown soft butter. It has a unique earthy aroma, so keep that in mind when formulating recipes. It will also turn your products dark. Ucuuba butter is very hard, so it's often mixed with other body butters or carrier oils before it's used. The fatty acids in ucuuba butter promote cellular development for your skin and hair. It's also high in vitamins A and C for hair and skin health. Ucuuba butter also has natural antisetic and anti-inflammatory properties, so it's great for irritated skin or eczema. For the hair, ucuuba butter boosts shine and elasticity for less breakage. It also helps hydrate dry or damaged hair. Have you used any of these hair and skin butters in your DIY beauty or DIY bath and body recipes? Which ones are your favorites?